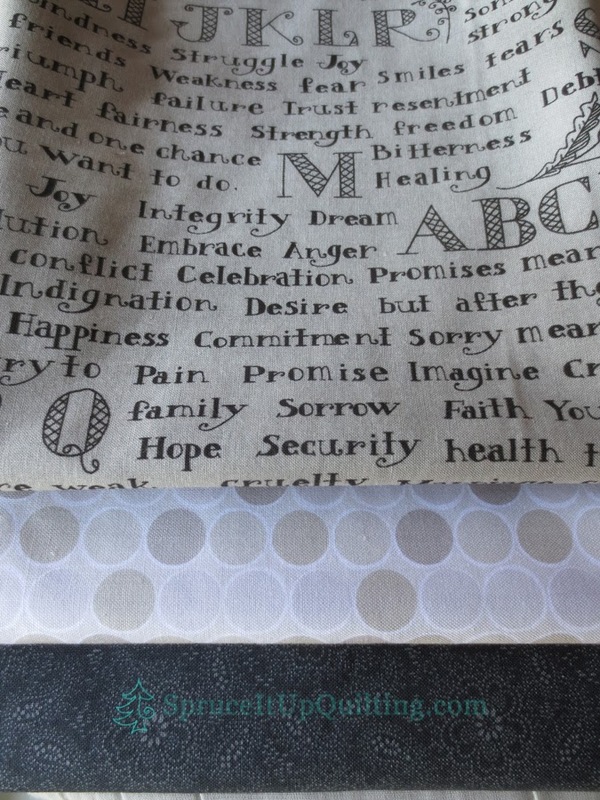 Spruce It Up Quilting: Nervous reflex! Broker's Open House was on Friday December 13th from 11-2 pm. The house looked great, the sun was shining and it was warmer than it had been in about 1 month. All good signs! So what was I suppose to do during those three hours?? My mind was definitely not on Christmas shopping. It's hard to concentrate on anything when your thoughts run through the images of your home wondering what a newcomer will see and think when they visit. My soul told me to go play with fabric. It's a nervous reflex. There's something calming about designing whether it's a garment or a quilt. 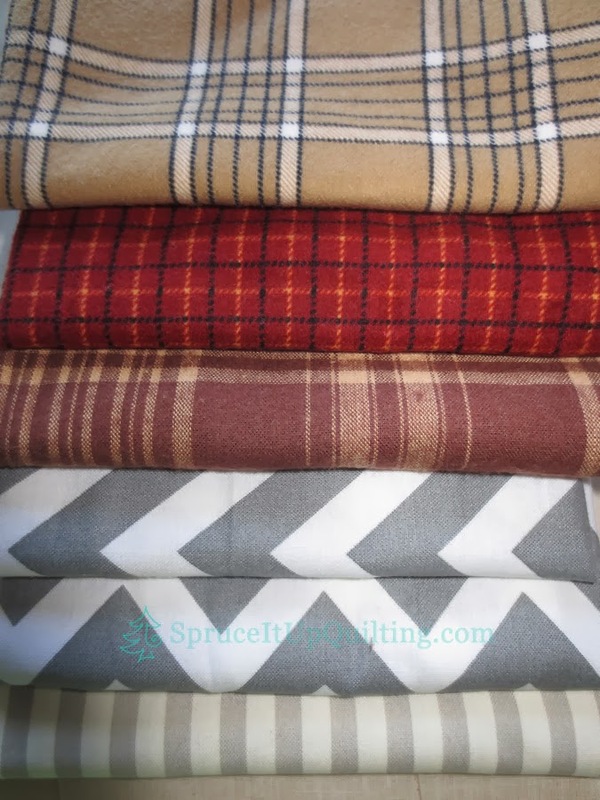 Looking at a particular fabric can instigate the beginning of an idea which quickly blossoms into a doable project. Have I ever told you about my "fix" when I'm in a slump or designing drought? I visit my local JoAnns, grab a cart and head for the quilting cotton section. There I will browse until I find a fabric that speaks to me and drop it in my cart. 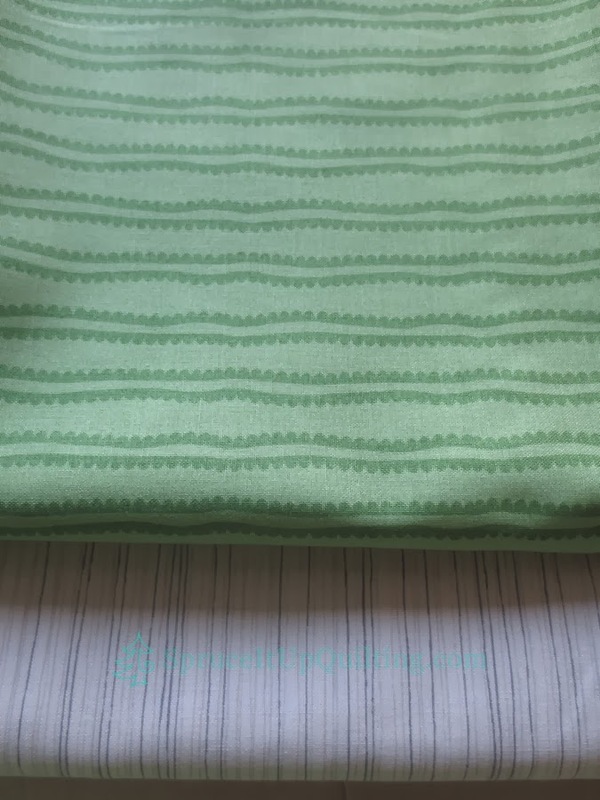 Along with that one fabric, I will choose coordinating ones and put my mind through a pattern slideshow. Sometimes it doesn't take long and I have a dozen fabric bolts in my cart with a clear picture of what I want to make. Then comes the hard part: I visualize my own fabric supply and try to figure what, from the cart, can be substituted and I replace that bolt on the shelf. There are times when I've completely emptied the cart and left the store to rush home and get started pulling the fabrics from my shelves. Some days, I've found myself at the cutting table with the whole lot. Rarely have I left the store without feeling "refreshed" and no longer suffering from designer's block. I do love buying fabric but I've also been extremely happy on those days when I leave the store without buying knowing that I have something in my stash that will work just as well. Sometimes too, just exercising my brain this way is enough and no quilt ever comes of it. Friday, my soul needed a good feed! I visited my favorite local quilt shop: Quilt Emporium. 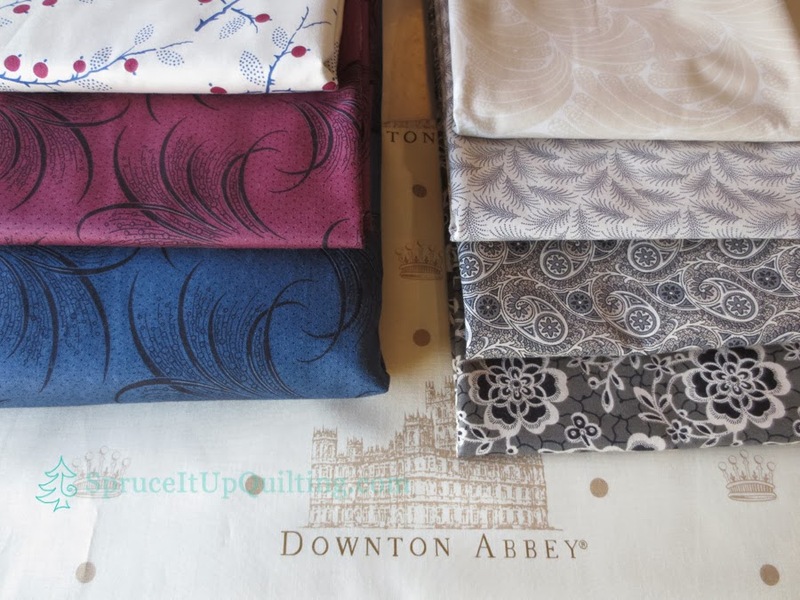 I've been curious to see the new Downton Abbey fabrics having seen them online which really doesn't do this fabric line justice. The fabrics are luscious. Do visit the link to Quilt Emporium to see the Downton Abbey display at Quilt Market Houston 2013! Fran showed me her quilt made using a pattern called Counterpoint as seen on QE's Quilt Market page. It is magnificent! Great job Fran! Love those colors in the pale violets. I wanted a different spin to the quilt so I set out to flip the colorway to dark sashings. We'll see if I can accomplish how my mind sees the quilt. I do love these colors. The ecru fabric at the bottom will be used as backing. The following cuts aren't from the Downton Abbey line but I want to include them as they fit the color scheme I have in mind. 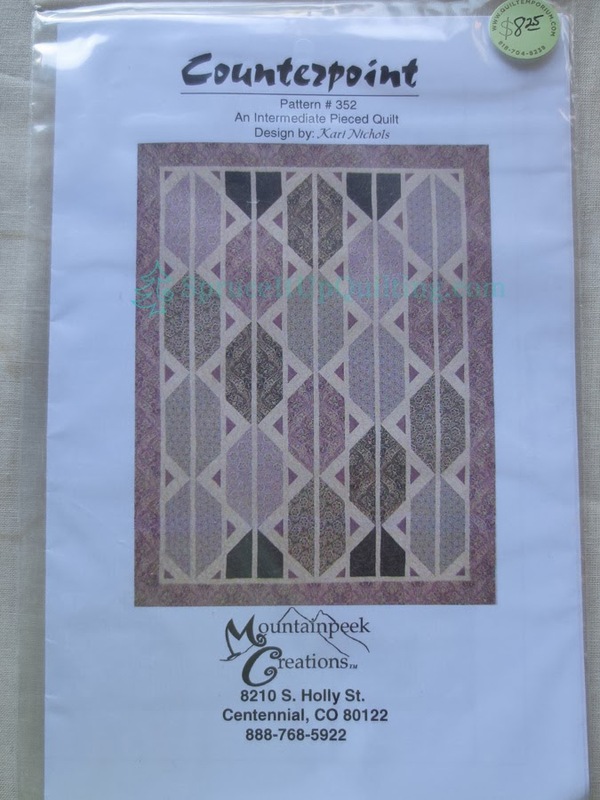 This is the pattern designed by Kari Nichols; it's an intermediate pieced quilt. My love of plaids and patterns was soothed too. I find I don't have enough grey fabrics! I must start to fill a shelf with them soon! Quilt Emporium has a wonderful tradition: In December, in celebration of 12 days of Christmas, they offer a new stocking stuffer at a reduced price each of the 12 days! This needle threader was featured on a day last week and I went to the video to see how it works. Turns out it's a fabulous tool to own. As I get older, the hole in the needle gets blurred and I find threading becomes a challenge. This should help with the task! And I love how you can store your needles in this case! It even has a little cutting blade so you don't need scissors to cut your thread and a magnet to pick up the needle. All in one versatility! Saturday, one couple who happened to drop in during the Open House returned for a visit accompanied by their realtor and their adult son. They were here for almost 2 hours! Then silence!! Isn't waiting for news the hardest part of buying and/or selling? 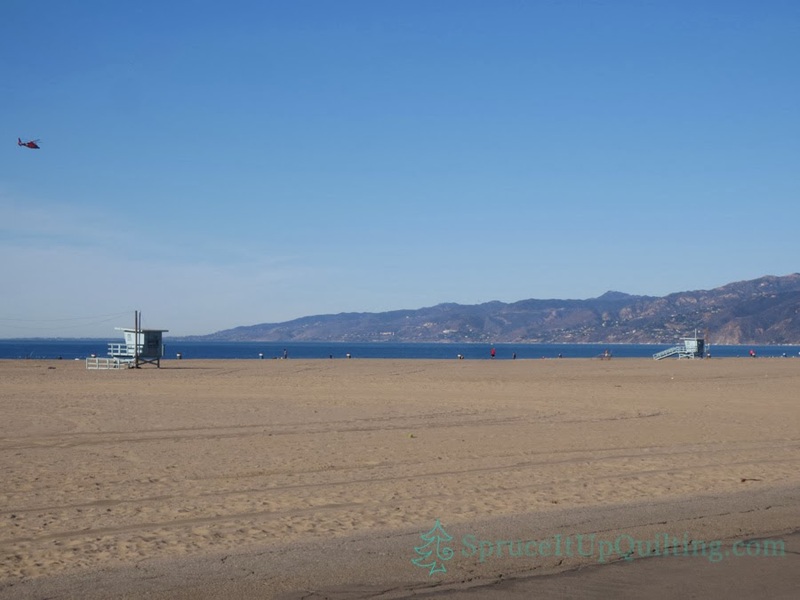 So yesterday, in order to keep calm, we joined our friends for a bike ride along Santa Monica beach... the weather was wonderfully warm and dry. Love those Santa Ana winds that clear the air of pollution and brighten the view of the mountains. Today, we have an offer! Wish us luck in negotiating the next steps of this nerve-provoking process! I hope to be able to devote enough of my energy and concentration to get this new quilt top made in the next few days. I love sitting at the machine to just sew; it's when I am most successful at finding solutions to any problem that may arise! I think my reflex on Friday was a good one! Expensive but it felt great! Thanks for your help once again Fran! Now series 4 of Downton Abbey can't come soon enough! 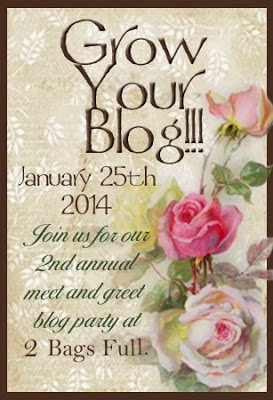 What a great post, Lorette! I really enjoyed hearing how you work through your creative process. And I believe I have completed some of my best work under stress. I love the pattern and fabrics you have chosen! I guess I had better get on the Downton Abbey bandwagon and watch some shows...maybe in February when I am bemoaning the end of my trip and trying to find ways to embrace winter once again. Hope there is good news to share on your house!! You will LOVE Downton Abbey! We are hooked and can't wait for Series 4. Watch for an update to this quilt; it's moving along well. Can't wait for your trip! We'll have fun! While you explore, we'll be on our way "HOME"!!! Hope all the snow happens before we hit the road and not during! What are our chances? ?